The Funky Felter: Yippee! 100th sale on Etsy! Yippee! 100th sale on Etsy! I reached my 100th sale on Etsy this week! A big woohoo and yippee!! As of this month, I've had my shop, thefunkyfelter, on Etsy for a little over 6 months. I'm quite surprised and thrilled at how well I've done thus far. The sellers' community of Etsy and the buyers there have been so helpful and encouraging. I thank all of those buyers who have helped me to reach this milestone! I've received such great feedback comments from many of you, and it is much appreciated. I'm also very grateful to all the supportive sellers on Etsy and the Etsy admin who keep it all up and running. 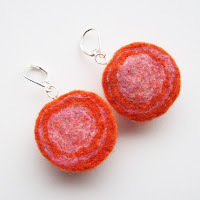 The 100th sale couldn't have been to a nicer Etsy buyer and seller, berkshirehostess, for a custom made pair of pink and orange geode earrings. I really appreciate her business and was happy to do her custom order. I always enjoy making wool beads for jewelry, especially in such bright, summery colors. If you like what you see in the geode earrings, be sure to check out my shops for what is currently available or contact me for a custom order of your very own. 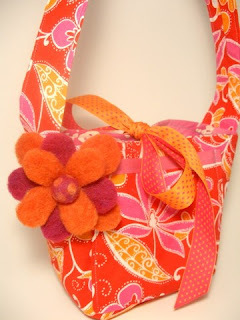 Berkshirehostess also has her own shop with a fabulous variety of aprons, handbags, and other crafty handmade items. The first item that she purchased from me was one of my flower pins in the "Wild Child" series, so called that because of the vibrant colors. You can see it attached to one of berkshirehostess's wonderful handbags in the photo. Although she's keeping the flower brooch to adorn a hat of her own, the lovely handbag is available for purchase in her Etsy shop so go have a look! Although my "Wild Child" series of brooches have sold out, I do have several other pins and brooches to choose from so that your purse, handbag, or hat is not lonely. You have to make sure to accessorize! . . . And perhaps, I will revive that "Wild Child" series of brooches again. I do love those vibrant, happy colors! I hope to have 100 more sales on Etsy before the end of 2007 comes! I really think that is an attainable goal. Besides, it is always good to have a goal in mind to work toward. Now I just have to find the time to get off the computer and get to work on some feltmaking and other crafty endeavors.